The facts were, the Penguins entered the playoffs as the top team in the Eastern Conference having scored more goals than any other team in the NHL. They had some minor difficulties getting by the New York Islanders in the quarterfinal round but they defeated the Ottawa Senators in five games to make it to the ECF. Four games and just two goals later, the Pens were scheduling tee times having been unceremoniously spanked by the Bruins. Sidney Crosby was held without a point by the Bruins and their hotter-than-the-sun goalie, Tuuka Rask. The Pen’s power play entered the series against the Bruins at 28.2 percent but went 0 for 15. They seemed lethargic at best. There was plenty of blame to go around without even mentioning Marc Andre Fleury’s epic collapse. Pittsburgh sports fans aren’t known for letting embarrassing losses roll off their backs. A half full glass does not exist in the ‘Burgh. Heads must roll and blood must be spilled when Pens fans feel wronged...and they were hell-of-a-pissed. 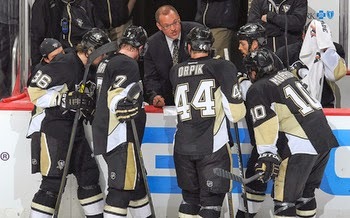 Many aimed their slings and arrows at Coach Dan Bylsma. Bylsma was hired in February 2009 to be the anti- Therrien. Disco Dan was more soft spoken and had already enjoyed some success coaching the WBS Penguins. Therrien’s style of calling players out in public and ranting about rather than correcting poor performance had worn thin with the Pen’s star players as well as management. The players thrived under the coaching change as though they had been injected with B12 and the rest is Stanley Cup history. While Bylsma has fared well as a regular season coach, his playoff record has left Penguin management and fans scratching their collective heads. His journey from being an interim coach to a Stanley Cup and Jack Adams winner is still a veritable hockey fairy tale but that isn’t enough in an organization that expects a Stanley Cup run and invests heavily in it every year. When it counts the most, Bylama’s boys have gone bust. 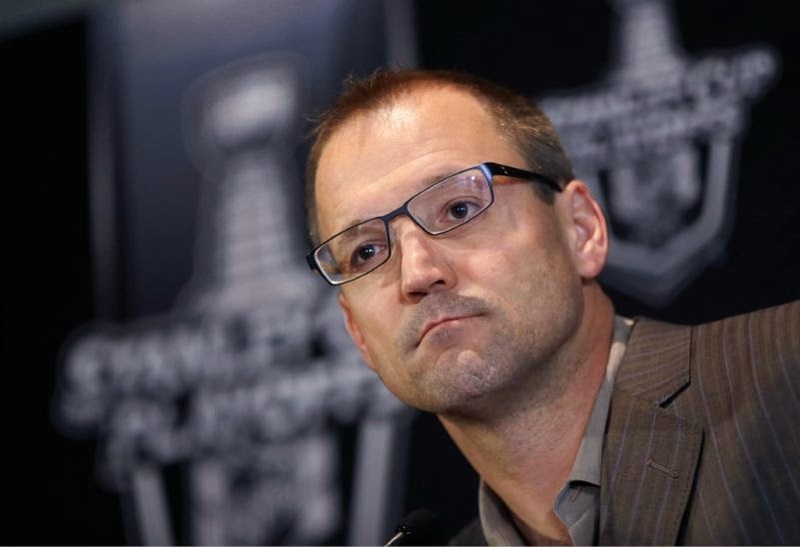 Since the Penguins captured the Cup in 2009, Bylsma’s teams have yet to miss the playoffs. There was a six-game win over the Ottawa Senators in 2010, before the Montreal Canadiens ousted them in seven games in the next round: Bylsma was outcoached by Jacques Martin. In 2011, Bylsma was outcoached by Guy Boucher and the Tampa Bay Lightning eliminated the Penguins in seven games. Face the facts: Bylsma was outcoached against the Flyers last season, and again against the Bruins this year. In both cases, he was left explaining how the Penguins stopped playing “their game” in a series, which is another way of saying their opponents found a way to prevent them from doing so and Bylsma didn’t have an answer. In consecutive playoff eliminations, the Penguins haven’t just lost, they’ve come unhinged. Even before the last game was played in Boston, rumors circulated that Mario wanted Bylsma gone but Shero went to bat for him. Whether that rumor was true or not Dan Bylsma was offered and signed a contract extension that runs through the end of the 2015-16 season. His assistant coaching staff of Tony Granatto and Todd Reardon will stay intact. Even though he was extended, that should hardly be taken as a ringing endorsement. In August, the Penguins hired long time NHL coach, Jacques Martin to be an assistant coach under Dan Bylsma. 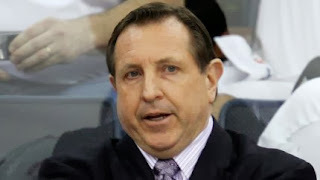 The 60-year-old Martin has spent 17 seasons as a head coach, compiling a 613-481-119 record during stints with St. Louis, Ottawa, Florida and Montreal. He too has won the Jack Adams. His in 1999 when he led the Senators to a 44-23-15 record and the franchise's first-ever division title. Most recently he worked as a television analyst. In an interview with CBC Sports after his appointment, Martin said of signing on as an assistant, "I think I've always looked at coaching, whether I'm the head coach or an assistant coach as teamwork, working together," Martin said. "Yes we have different responsibilities, but I've always felt that I wanted my assistant coaches to be strong-minded, strong people that express themselves." The two men are very different with different coaching styles. Martin is also a low-key man, bland in media interviews and mostly quiet behind the bench. In contrast, Bylsma is personable, witty and intelligent when interviewed. Bylsma favors a north south game with pressure on the forecheck. He has a high hockey IQ but seemingly endless stubbornness. Why was Tyler Kennedy traded….so Dan Bylsma would stop playing him. Martin's system emphasizes defensive play and keeping players close together on the attack to support each other. “I believe in a puck-possession game,” Martin said in 2009 upon being named head coach of the Montreal Canadiens. “I think the best defense is if you can play in the offensive zone.” In 2011 sloppy play, blown leads and a poor record on home ice all conspired in the firing of Jacques Martin as coach of the Montreal Canadiens. Is the addition of Martin to the coaching staff an insurance policy in case Bylsma chokes again? Systems need to be adjusted according to the personnel. 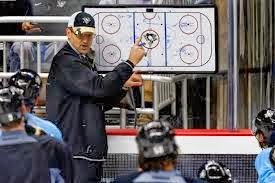 Dan Bylsma needs to bring his forwards back towards the defensive zone and play through the neutral zone. This will not only make it easier on defensemen to advance the puck up the ice, but it will also get the forwards back in proper defensive position to help prevent the odd man rushes off turnovers in the transition game. If Bylsma isn’t able to achieve playoff success, Martin will have spent 1 year within the system and be capable of stepping in at any time. I get the feeling Bylsma had two choices; accept Martin or leave. The only way he can remain as head coach for the Pens for the next few years is to use Martin to his full potential. So far, this season, the Pens look sharp. They seem more focused, more purposeful on the ice. Fleury seems to make confident, fluid movements. The power play gets set up and executes shots rather than looking like it’s doing passing drills. The defense seems tighter and calmer; more cohesive. All of this without Letang, Neal and Bennett. If too many cooks spoil the broth do too many Jack Adams winners behind the bench succeed in the playoffs?